For many women, shaving your legs is a kind of right of passage into adolescence. But after some time, it just becomes another burdensome task of western womanhood. You still want smooth legs, but you don’t want to have to shave every other day to maintain them. For women and men wondering if this cycle of shaving is really worth it, it’s time to take into consideration another solution. Here are 5 reasons you should stop shaving your legs now, and the leg hair removal method you should be doing instead. First, razors themselves are highly unsanitary. Sure, a razor blade taken fresh out of the pack is sterile. But even after a few uses, the blade starts to collect bacteria and the metal begins to oxidize. In fact, a study from 2012 found nearly 5 million bacteria present on a single wet razor. 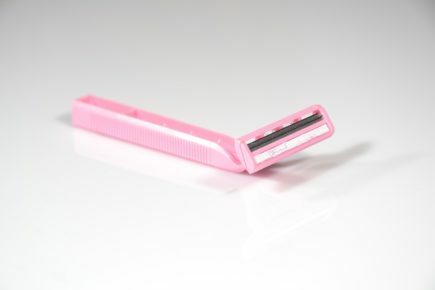 To avoid this, it is recommended that the razor cartridge be changed after five uses at the most. Even if you do not shave your legs frequently, you should never keep your razor for longer than one month as the prolonged exposure to moisture will cause it to collect bacteria. Any longer longer than this will result in a dull and rusty blade which is dangerous for the skin. Shaving can produce painful and unsightly ingrown hairs, and razor burn, and cuts. Ingrown hairs typically occur as a result of the bacteria from the razor entering into the pore, causing the hair to retreat back towards the follicle and grow under the skin. Razor burn can also result from bacteria, a dull razor, or as an irritation from shaving. Even if you shave very carefully and with a protective layer of shaving cream or another moisturizing substance, you are still at risk of nicking yourself. So, while you may have removed the hair, you can still be left with red, bumpy skin that stands in the way of your search for smooth legs. Shaving does not remove the hair follicle. It simply cuts the hair until the surface level of the skin. For people with thick hair on their legs, shaving will only reduce the feel of hair, never completely eliminate it. Additionally, if you have dark hair and light skin, the root of the hair is often still visible under the skin. While the myth that shaving makes hair grow back quicker or thicker has been sufficiently debunked, it is still true that the hair appears this way. This is is because shaving cuts the hair with a blunt edge, giving the hair the appearance of thick stubble. Since the hair is more noticeable this way, it seems like there is suddenly more of it. Even though this is not the case, the legs do look and feel less smooth. Finally, shaving is just a time consuming and tedious task. It takes repeated effort and yields temporary results. If having smooth and hairless legs is a priority to you, then you should consider a more effective solution than shaving. Laser hair removal for the legs is one of the most effective solutions for prolonged hair removal. Laser hair removal is not completely permanent, but it significantly reduces the look, feel, and presence of hair. So, even when it does grow back, it is hardly noticeable. Many people hesitate to book their laser hair removal session because of cost. While laser hair removal requires a greater upfront investment, in the long run you will actually save time and money by cutting razor expenses and shaving time out of your regular routine. Ready to say goodbye to your razor? Book a laser hair removal session at Laser by Aleya in Long Island.